The Farmers and Merchants Bank building, initially constructed in 1904, received its beautifully detailed beaux-arts façade in 1922. Frank Benchley, a local architect, designed this embellishment. 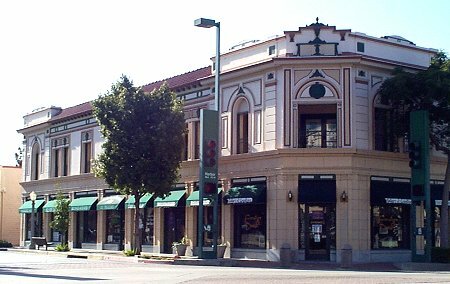 Accented with ornate classical motifs, this two-story building located on the southeast corner of Amerige Avenue and Harbor Boulevard is the only example of the Beaux-Arts style in Fullerton. A dramatic diagonal corner entrance, crowned with a decorated parapet, provides the focus for the front (north and west) façades. The use of shields, recessed panels, faux stone, molded trim, and classical floral motifs provides the decoration for the exterior of these building sides. The façade of the first floor appears much as it did after the remodel in 1922. Glazed terra-cotta tile in a rich honey color forms the pilasters and cornice of the first floor. Light gray granite is used on the bulkhead below each window and at the bottom of the pilasters. When the building was extensively rehabilitated in 1989, the windows on the second floor were removed, and a wrought iron railing was installed between the openings. The floor plan of the second story was redesigned so that a perimeter corridor now provides the access to numerous tenant spaces. One difference may also be noted on the first floor: the building no longer has a central entrance at the south end along the west façade. The Farmers and Merchants Bank - the forerunner to the Bank of Italy and later the Bank of America -- played a significant role in the economic development of the city. 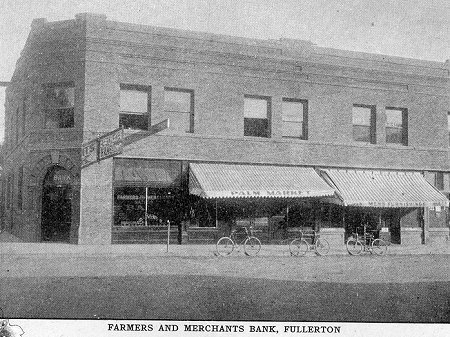 It was the first bank in Fullerton and was founded and continually managed by the area's most prominent citizens of this era: Charles C. Chapman, Attilio Pierotti, Samuel Kraemer, E. K. Benchley, August Tousseau and others. Indeed, there was a direct connection between the bank and the citrus industry. All of the men gained their fame and wealth with their involvement in the citrus and packing packing house industry, and all owned large ranches. The list of directors and officers of the bank were the same men who shaped the city during the first three decades of the 20th century. After the Bank of America vacated the building in 1944, the Fullerton Music Company occupied it for over 40 years. The building was completely rehabilitated in 1989, when it was converted for use as a multi-tenant commercial building and given the name Landmark Plaza.